If anyone ever asks which nation holds your allegiance and you find yourself wearing this quiver, you need only turn around and show them. 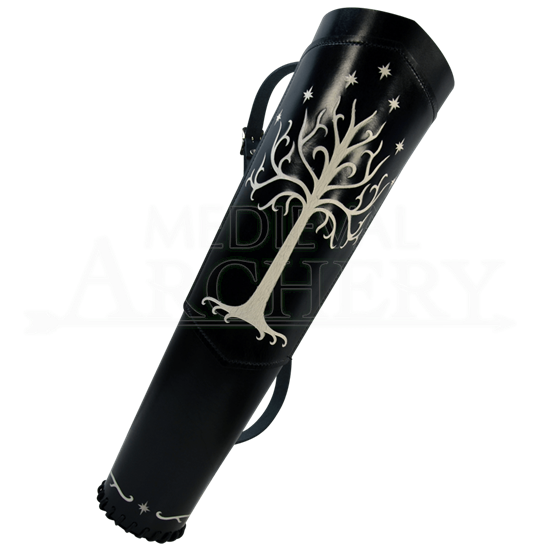 This Tree of Gondor Quiver is an accessory that no man of Gondor who carries a bow, whether he be a royal archer, a lowly hunter, or a formidable soldier, should ever be without. Inspired by the realm of Gondor, which comes from Tolkiens land of Middle Earth, this impressive quiver is crafted from top quality 7-8 oz. leather. Emblazoned on the quiver is the White Tree of Gondor, a symbol which depicts an elegant and twisting silver tree that is capped by seven matching stars. The tree is unique in that it features a distressed finish, so the white looks like actual tree bark. This emblem is located on a leather plate that adorns the quiver, while the base of the quiver features another three white stars, as well as a flowing white vine pattern. It is also constructed to feature a slight lip on one side of the quiver, with one edge being taller than the other. All in all, the design is simple yet appealing and eye-catching, and one hundred percent true to the coat of arms of the realm of Gondor. The black quivers appearance is subtly enhanced by its quality construction, and it is held together by heavy lacing which secures both the bottom and the back of the quiver. It also features an adjustable leather shoulder strap, which secures via a buckle, making it perfect for archers of all shapes and sizes. The quiver measures 22 inches long at its longest (20 inches long at its shortest) and features a diameter of 4.75 inches. This quiver is handcrafted right here in the USA and is exclusive to our shop. This quiver is perfect for those LARPers who wish for their character to hail from the lands of Gondor, and it makes for a doubly impressive archers accessory, thanks to its detailing and its design. 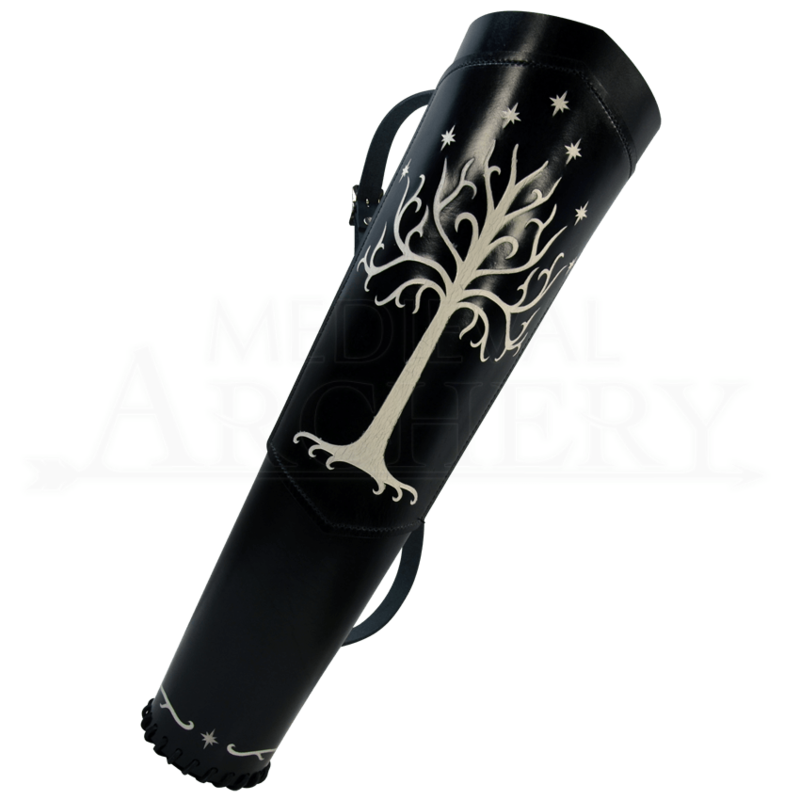 All in all, the Tree of Gondor Quiver is an excellent way to hold your arrows, whether you are just looking for an interesting and cool design or whether you want to show a little love and loyalty to the Kingdom of Gondor in the lands of Middle Earth. Bought this as a Christmas present and was SO pleased with the reaction of the receiver! Good quality, good price, great experience with your site and products! Very nice item the art and quality of the quiver are outstanding, perfect.